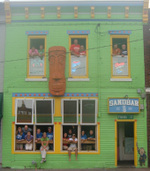 Sandbar 2011 Graduate: Kristina - The Sandbar...Home of the Indoor Hurricane! Last week, we put out a call for graduating students who love the Sandbar. Our first 2011 graduate profile is Kristina. Read what she has to say about the bar below. Are you a Sandbar graduate this year? We'd love to hear your story, too! My name is Kristina, and I am a senior from Palos Verdes, California. T he Sandbar is my absolutely my favorite place in Lawrence! It combines the small, college town feel with a little taste of home for me. From the moment I discovered the Sandbar it has been my home away from home, and my first choice for any night of the week. While the weekends are always fun, it is those random weeknights where the bar has a mix of locals and college students and the oldies on the jukebox that I will always remember! We've even named our favorite fish, Gilbert! My drink of choice is the Pink Flamingo! And of course, a Dirty Banana shot of the surf board! I don't know where life after graduation will take me (here's hoping for a job in Vegas!) but I know the Sandbar will be a part of every visit I make back to Lawrence! I only hope I can be as fun as these guys when I get older! I'm sure they Sandbar song will be stuck in my head for the rest of my life -- Meet me down at the Sandbar, HEY!